We are thankful for so many things here at Clemson Girl that a blog post could not even begin to cover it. We are so thankful for our amazing sponsors who help keep this little blog chugging along, and so very, very thankful for all of our real-life Clemson Girl readers! We hope you are enjoying a day of leisure with your families and friends, and of course, lots of delicious food. When Couture Cakes of Greenville recently contacted us about a giveaway, we couldn't think of a better day to do it than today on Thanksgiving - to show you just how SWEET we think you, our readers, are. Couture Cakes of Greenville is located right off of Woodruff Road, where 385 and 85 meet (click to see a map). If you are looking for that “different” cake, Couture Cakes is THE place to go. Voted Best of The Knot 2012, Couture Cakes can create mad hatter style cakes, custom 3-D or 2-D cakes, and cupcakes just to name a few. They offer many choices of cake flavors, fillings and icings. Couture Cakes' delicious cakes and cupcakes are made with family recipes that melt in your mouth. You can still order cakes or cupcakes for your tailgate Saturday! Wow your tailgate when you show up with an array of Clemson cupcakes - order by phone (864-288-6610) or by email (susan@couturecakesofgreenville.com). They are closed Thanksgiving (you can still email orders), but are open Friday 9am to 6pm and Saturday 9am to 1pm. When owner Susan contacted us about possibly doing a Clemson cupcakes giveaway for our readers....we replied instantly... "Susan, you had us at cupcakes!" 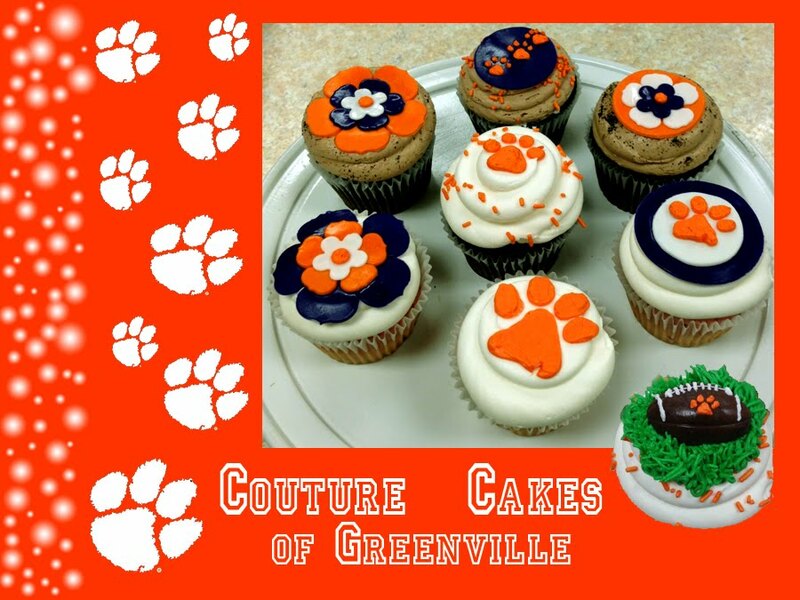 Yup, you read that right...Couture Cakes of Greenville is giving one very lucky Clemson Girl one dozen, assorted flavor cupcakes with Clemson themed designs (see photo above)! All the winner has to do is swing by Couture Cakes of Greenville to pick up the cupcakes prize on Friday after 2pm or Saturday between 9am and 1pm. These will be perfect for your Clemson vs. USC tailgate or game viewing party! Deadline for all entries is tonight, Thursday, Nov. 22 at Midnight EST. We will contact the winner by email or by Facebook message early Friday morning. We will also announce the winner via Facebook and Twitter if possible. The winner will have until 3pm EST on Friday Nov. 23 to contact us or we will draw a new winner. The winner will have to pick up their prize from Couture Cakes of Greenville's location and must pick the prize up by 1pm EST Saturday, Nov. 24 or the prize will be forfeited. This is a SWEET and fabulous prize ladies! My mouth is watering just thinking of these delicious cupcakes. Big thanks to Couture Cakes of Greenville for sponsoring today's giveaway! And thanks for being fabulous Clemson Girl fans and have a wonderful Thanksgiving and GO TIGERS! I'm most thankful for my health and my family!